One of only 6% of 1,100 submissions to be awarded a top prize, SweetRush’s winning campaign demonstrates results-oriented, education-based marketing communication. 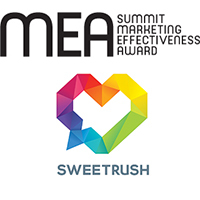 San Francisco, Calif., October 17, 2016 – SweetRush is a Platinum award winner in the “Education Marketing” category in the Summit Marketing Effectiveness Award competition. The award recognizes SweetRush’s work with Bridgestone Americas in developing a holistic, education-based marketing program for extended-enterprise sales associates. “Education marketing is still a relatively new field that has largely been the purview of agencies. What’s different about SweetRush is our ability to combine agency-level creative with the art and science of instructional design. The result is education-based marketing that’s both engaging—including branding, 3-D, and gamification—and truly effective,” said Arturo Schwartzberg, Co-founder and Chairman of SweetRush, Inc. The Summit Marketing Effectiveness Award (Summit MEA) responds to a common need in the marketing and advertising sector: to acknowledge the contribution of results and messaging, and the achievement of the marketer’s business goals. The Summit MEA is unique to other award programs because it reinforces that the goal of marketing communications is to change, influence, or reinforce an audience's knowledge, attitudes, or beliefs. Using this premise as a basis for its judging criteria, the competition is becoming a true arbiter of marketing communication effectiveness. During the 2016 event, judges analyzed submissions and selected only 6 percent to receive the top spots. A truly international competition, the Summit MEA received submissions from the following twelve countries: Australia, Canada, England, Hungary, India, Nigeria, Philippines, Singapore, Republic of Korea, South Africa, Turkey, United Arab Emirates, United States, and Wales. The SIA organization was founded in 1994. Annually it conducts the Summit Creative Award, the Summit Marketing Effectiveness Award, and the Summit Emerging Media Award. Additional information about the Summit International Awards organization, its competitions and winning firms can be found on the SIA web site.